Clematises are the climbing plants. These plants help to decorate various arches, a handrail, old trees, lattices, fencings. They are rather attractive. It is necessary to choose the solar, protected from a wind places. 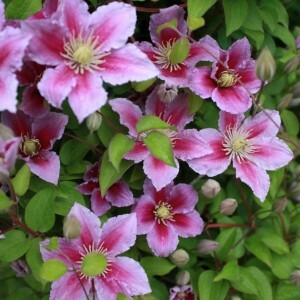 If lighting is insufficient, clematis will not blossom at all. If you place this plant at a house wall, you would choose east, southeast, southern and southwest walls. It is impossible to land clematis close to the wall because in this place the plant will growth slowly, will flourish rare and the blossoming will be poor. If such landing is inevitable, constantly water the plant and feed it up. The water flowing down from a roof shouldn't get on lianas. The appropriate distance to a wall of the house should be of 30-40 cm. At group landings the distance between bushes has to be not less than 1 meter, it will allow to receive to each plant enough light. Clematis cultivation. All about climatises.